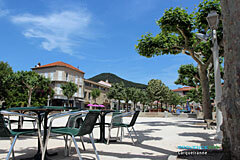 Carqueiranne is a little Provençal harbour on the Var coast, in the bay of Giens between Toulon and Hyères. 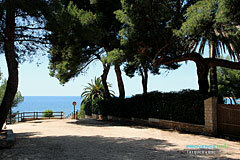 To the west, following a narrow road along the Mediterranean coastline, you reach Toulon Bay. Travelling east, along the coastline decorated with pine trees and agaves, you will arrive at Almanarre beach, a world renowned windsurfing spot. If you continue in the same direction, you will discover the Giens Peninsula, with its fir trees and little harbours at La Madrague and Le Neil. 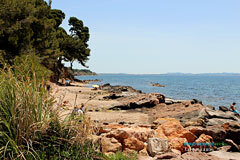 Just opposite you will see the famous Golden Isles : Porquerolles, Port Cros and l'île du Levant (given over to nudism). 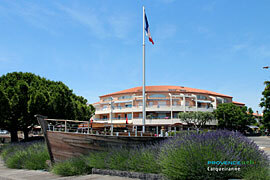 With its 7 km of fine sand beaches and sunny coves, Carqueiranne is a well-known sports and seaside resort. This is mainly due to its micro-climate (and also its bouillabaisses). This micro-climate facilitates flower growing and perfume production. Their enchanting fragrances will delight you, especially the tulips and gladioli. To the north, you can walk in the hills covered with Aleppo pines, constituting a green mantle in both summer and winter. St. Madeleine Church, St. Vincent Park, beaches. The classified site of the Pins Penchés (the leaning pines). Various water sports, tennis, golf. Hiking: Pointe du Baou Rouge, Richet Castle, the Paradis mountains.